I'm going to show you, step-by-step, how we more than doubled a local Physiotherapist's inquiries by making these simple, but fundamental SEO fixes to their website. If you have a website for your physio practice that does nothing in the way of generating patient bookings for your business, then this post is for you. Most physiotherapists (and others in the allied health space) are more concerned with how their website looks and feels rather than how it will generate inquiries for their practices. So they focus on getting a pretty website, with lots of pictures and sliders and spend very little time on actually making sure that the site will get found in Google by those people looking for a local physiotherapist. Frustrated with no inquiries, many business owners will invest in some shady SEO campaigns which have promised to get them to #1 in Google, or end up paying for Google Ads and Facebook Ads with the hope they will get a stream of steady patient inquiries. In the end, most of them are out of pocket with an expensive website that generates no leads. "We just spent thousands on this website and you're telling me it's not working?" is a common phrase I hear. Here's the reason why most Physio websites don't generate leads. They are simply not properly optimised for local search! Physio's are local businesses. They serve patients within a specific geography. Google's goal is to deliver the best and most relevant search results possible. It wants to show your website to prospects in your area if you are the best local result for those prospects. So why doesn't your website get found? "My web designer said it was optimsied for SEO. I mean we've got an SEO Plugin installed!" is what a lot of people say. Well, in the rest of this post I'm going to show you step-by-step how to fix the most common SEO problems that stop your local website getting found in Google. If you are interested, it's quite easy to diagnose these issues and I'm more than happy to review your site and discuss your options in a strategy session where I can give you 1 on 1 feedback on how to fix your website. The site I was asked to look at was a physiotherapist located in the Melbourne CBD. Their site was recently rebuilt and their website traffic and inquiries had been declining since the relaunch. This is a common issue when new websites are launched because the web designer didn't properly optimise the site or make sure current Google rankings were maintained when the new site went live. The client asked us to review the site and look for opportunities to improve its how it was performing in Google. 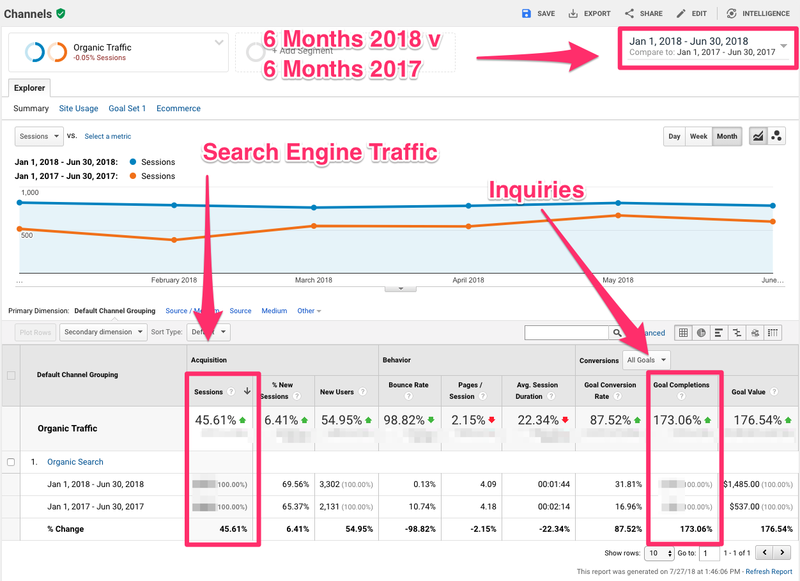 Before we get into the detail of what we actually did to more than double their inquiries, here is the impact of the fixes to the site on both traffic and inquiries, comparing January to June 2018 to January to June 2017. Can you imagine what this increase i the number of inquiries would have on your business? The first issue was that few of the pages on the site were optimised to target the right keywords. They had the brand name in them but had titles like "Physiotherapy services" instead of keywords people actually used to find local physiotherapists. Fixing this allows you to rank for the right keywords people are using when looking for a local physio. We used a tool called SEMrush to find out which keywords people in Melbourne were using to search for a physio. We found that people typically search by either using "physio + location" or "physiotherapy + location" so it was critical that we make sure our page was optimsied to target both of these variations in a natural way. Remember the pages were previously optimised to target "physiotherapy services" which has far fewer searches. To help our website better rank for both variations we drafted a page title that included both variations in a natural way. We drafted a page title that included both of the ways people search and wrote a short but compelling meta description to encourage people to click through to the site. At the same time, we did keyword research on their other services such as remedial massage. We found that some of those pages were not properly targeting the right keywords. So we rewrote the page title and meta description for those pages as well. At the same time, we took the opportunity to work with their copywriter to rewrite the on page copy for those service pages, making them more comprehensive and focus on the benefits to the end user of the service. We also improved the calls to action by making the "Make a booking" and "Call us" links more prominent. After all, we want the visitor to actually click through and make a booking. Within one month of optimising the site, rankings for the pages jumped up and continued to steadily improve over the coming months. What about the impact on traffic? Well here is a screenshot of the improved traffic to the remedial massage page which we optimised. When we first analysed the site, it was loading quite slowly and the site had not yet been migrated to https which was an issue. Slow sites generally perform much worse in Google search and non-https sites were about to be hit with lower rankings and by being marked as not secure. Google is effectively forcing all websites to move their sites to https. This means their sites are more secure. They are "encouraging" site owners to make the move by giving https sites a small rankings boost as well as flagging non-https sites as "insecure"
It is expected that sites flagged as insecure will see lower website traffic as people trust them less and click through less. We implemented steps to migrate all of the pages on the site to https and made sure we notified Google of the change so the old pages were quickly replaced by the new secure pages. How quickly a website page loads will impact both the sites rankings and whether visitors stick around. Page load speed, especially on mobile devices is now a ranking factor in Google. Using a tool called GTMetrix we identified that the site load speed could be improved. We worked with the web developer to streamline the website code and optimise the site images so that pages loaded more quickly. In addition to improving rankings in normal organic search results, you need to make sure your business is listed in Google My Business, which allows you to show up in Google maps. This is critical for local businesses where Google wants to show your business to people in your area looking for what you do. 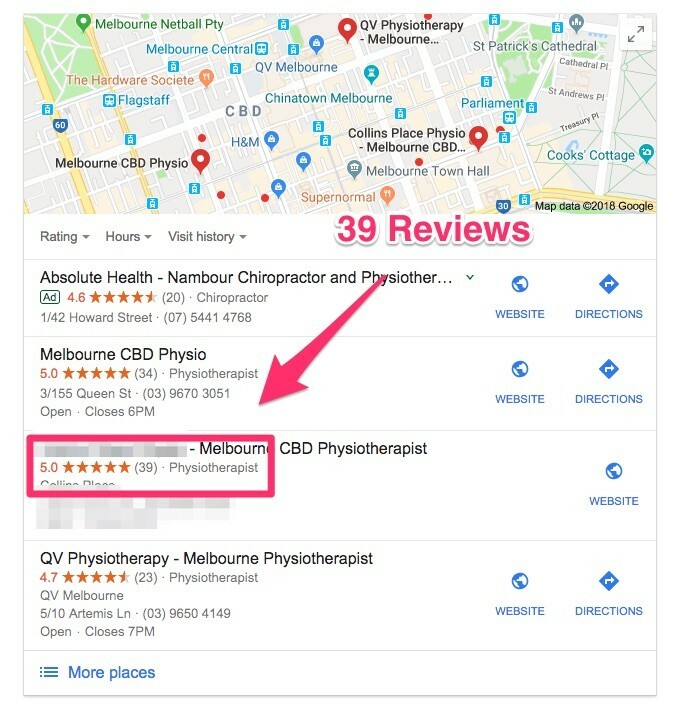 In this case, the client was not showing in the Google Maps three pack for physio searches done in Melbourne CBD. The client's Google My Business (GMB) account was not fully completed and optimised. The business was not listed in all of the available business categories that GMB provides for. If you are not in these categories, your site will not show up for them. When we started the site was listed in only a single category. Physiotherapist. We found and added a number of others to allow the site to appear in the Maps listings for these other searches. We also added the full number of images allowed and completed all parts of the GMB listing. One reason why GMB listings don't appear in the maps is when there are duplicate listings. These may have been created by a previous web designer, SEO or the owner themselves and they may have lost track of them. Whatever the cause, having them around confuses Google as to which listing to show in the search results. In this case, we found an old listing at the same address which was stopping the proper GMB listing from showing in the Maps. You can see from the screenshot below that the site appeared in maps only for its business name. We claimed the listing and then worked with the Google My Business support team to have this listing marked as closed and removed it from the search results. The impact of this was immediate with the site suddenly appearing in Google maps for the main physiotherapy related phrases. One of the most important aspects of doing well in Local search (Google Maps) is making sure that Google knows who you are and that you are located where you say you are. You do this by making sure that your business name, address and phone number are consistent between your website, your Google My Business Listing and you any third-party directories. This is called NAP (Name, Address, Phone Number) consistency. We then built out more quality backlinks by submitting the business to a list of 50+ quality local directories using our local link building campaign. We made sure that there was consistency between name, address and phone numbers. This process typically takes up to two months to secure all of the links we are targeting. You can see the spike in the number of sites linking to the client site in the chart below. The final area we needed to work on was to acquire quality Google reviews. Whilst reviews on Facebook and Truelocal are great to have, at the end of the day it's high rated Google reviews that will improve your rankings in Google maps. In this case, we created custom Google Review Templates using a free tool from White Spark, called the Review Handout Generator. 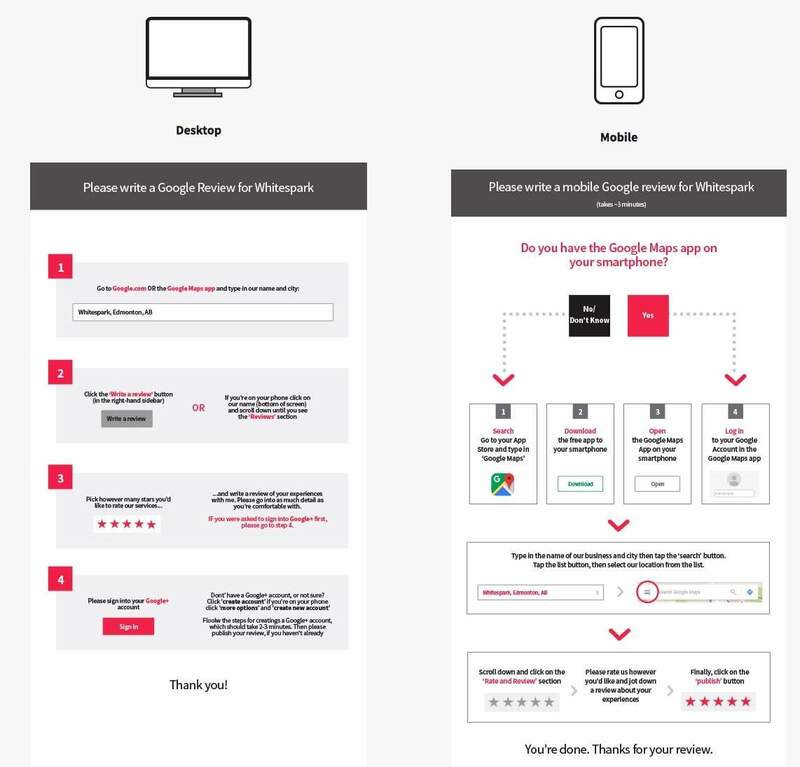 This tool creates what is essentially instructions you can hand out to patients or customers, which shows them how to leave a Google review for your business. Here is the current state of their Google reviews. They have 39 5 star reviews. The steps you have seen us implement to improve this sites SEO are just the first steps in our approach to improving online traffic. 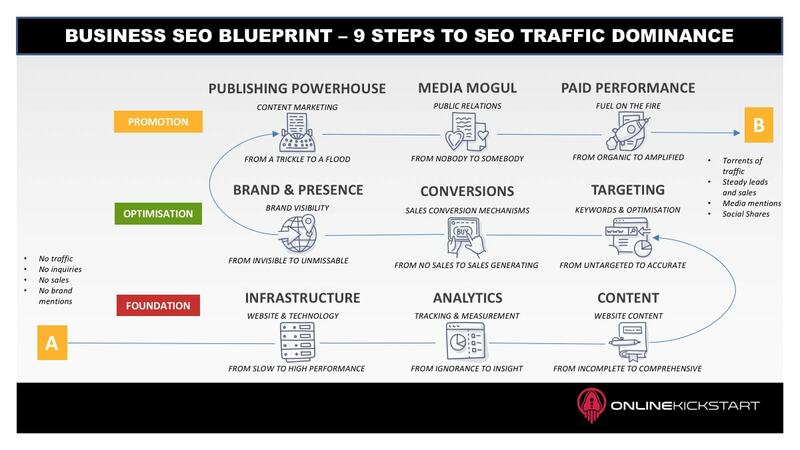 We call it the Business SEO Blueprint. There are still three additional steps they can take to really boost their traffic and patient inquiries. Are you a physiotherapist with a website that is currently not getting found in Google? Are you getting enough bookings for your physiotherapy and other services? Are you frustrated that your site isn't doing better? Your site might simply be a few fixes away from being a successful lead generating site. I might be able to help you improve things. Why don't we have a 15-minute chat to find out.